Well, now that the old servant's quarters have been removed, it's time to talk about the new addition to the Hall! Over the past few weeks, you've noticed that the construction workers have dug a sizeable pit on the north and east sides of the building. The pit is now the size of the new building. When the new building is constructed, it will wrap around the mansion is north and east sides. 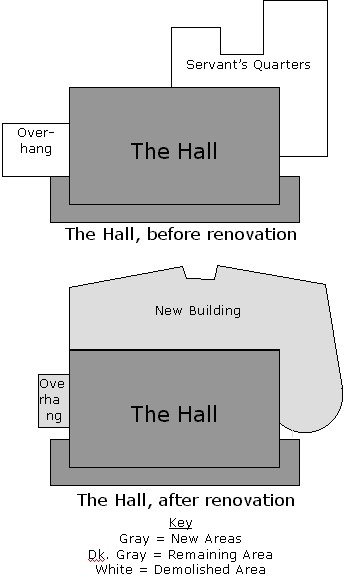 At left are plan views, showing the way the Hall used to look, as well as a projection of how it will look after all the construction is finished. A new library will be built inside the circular portion of the building. The rectangular area of the new building will house seven new classrooms and a multimedia center. An elevator will service all three floors of Hall. 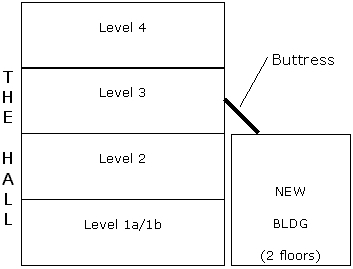 The third floor will be used for administrative offices. There will be a walkway from the southeast end of the Hall all the way out to the map near the parking lot. The engineers among us may be wondering exactly how this new addition stabilizes the mansion during earthquakes. It's quite simple, really. The addition will have several 'earthquake walls.' During an earthquake, the earthquake walls will absorb the energy from the earthquake, thereby reducing the amount of damage done to both the old and the new structures. In addition to these earthquake walls, several buttresses will be inserted into the mansion in order to stabilize both structures. Of course, we hope that these earthquake retrofits will never have to be put to the ultimate test! Several weeks ago, I had the good fortune of taking a guided tour through the upper two floors of the Hall. The interior piqued my fascination; the original builders have cleverly disguised the fact that the entire building is made out of concrete! At level 4, I discovered the building's true structure; all the interior walls have been removed, exposing the concrete floor, columns, walls and ceiling. Back in 1913, concrete buildings such as the Hall were constructed in a manner different from today: first a wood frame was constructed and then concrete was poured onto this structure. When I examined the ceiling, I could see the imprint that the boards left on the concrete. These imprints possess an incredible level of detail; were the coloring different, one might think that these imprints were real wood! 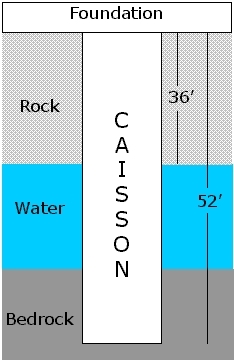 As for the construction itself, caisson drilling finished October 2nd, and now they are pouring the concrete foundation. By the end of December, the contractors should be finished pouring concrete and ready to put up the steel skeleton in January. If there are no significant construction delays, the building will be finished around July, 1998 and open in time for the 1998-99 school year. Tune in next month for another detailed report on construction activities.